Why have a lorica or shell? Galerie de l'Observatoire Océanologique de Villefranche-sur-Mer Aquaparadox: the diversity of planktonic microorganisms Tintinnids by genus images of over 200 species from around the world Introduction to Tintinnids Why have a lorica or shell? 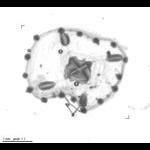 The lorica or shell likely evolved as protection against predation by other protists such as dinoflagellates and radiolarians who use feeding tubes and pseudopodia. The seemingly odd morphologies of planktonic organisms are the result of a "Watery Arms Race" pitting prey against predator according to Victor Smetacek.